Drs. 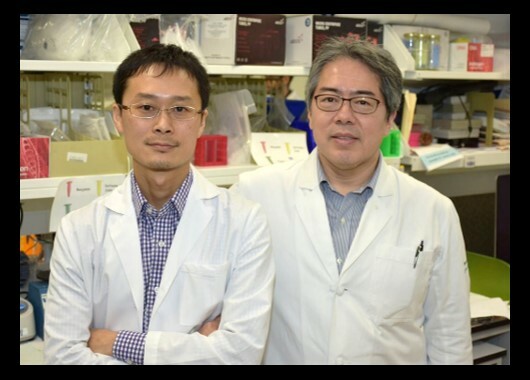 Tetsuro Kobayashi and Keisuke (Chris) Nagao, authors of the study. New research from the NIAMS Cutaneous Leukocyte Biology Section, led by Dr. Chris Nagao, uncovers how innate lymphoid cells regulate skin microbial balance by controlling sebaceous gland function. These findings lay the groundwork for future studies investigating how alterations in this relationship contribute to diseases, such as eczema. Homeostatic Control of Sebaceous Glands by Innate Lymphoid Cells Regulates Commensal Bacteria Equilibrium. Kobayashi T, Voisin B, Kim DY, Kennedy EA, Jo JH, Shih HY, Truong A, Doebel T, Sakamoto K, Cui CY, Schlessinger D, Moro K, Nakae S, Horiuchi K, Zhu J, Leonard WJ, Kong HH, Nagao K. Cell. 2019 Jan 25. pii: S0092-8674(18)31645-3. doi: 10.1016/j.cell.2018.12.031.